Talk about your projects, exchange ideas, tips, colors, etc. 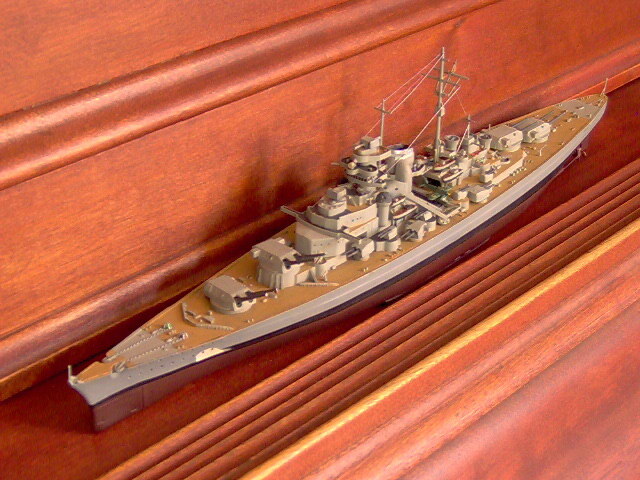 I just completed a restoration of a 30 year old model that I built years ago. I have the new premium Dragon 1/700th, and before I started that I wanted to experiment with colors, schemes, and reworking pieces to make them more authentic. It's the 1977 Monogram (not the Revell-Monogram 1/570 of the 60's), which I calculated as being at being a smaller scale but not much, than 1/600th, so the 1/615th sounds right. I see this kit is no longer available new, which is a shame because it's not too bad really, I believe far more accurate in its approximate scale ( Airfix, Aurora, & Revell). The admiral's bridge is a shortcoming, because it lacks the windows in the critical spot where Lutjens and Lindeman commanded the ship. I figured a way to do it that came out well. Monogram should have done a decal for this, if not revise the part. I think that ships were not very successful for Monogram, despite their excellent value and quality, they got in too late, when modeling was in decline. 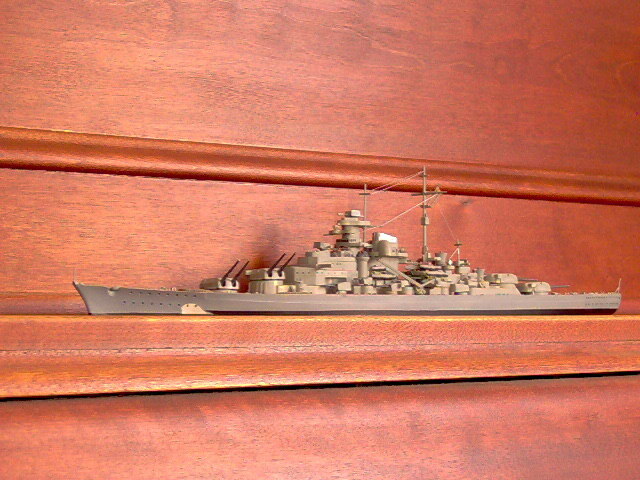 I'd like to share some pictures with KBismarck members, because there are no pictures in the model section of this mold, and, I went to a lot of trouble to EXACTLY follow the line drawing recommendations of this site. 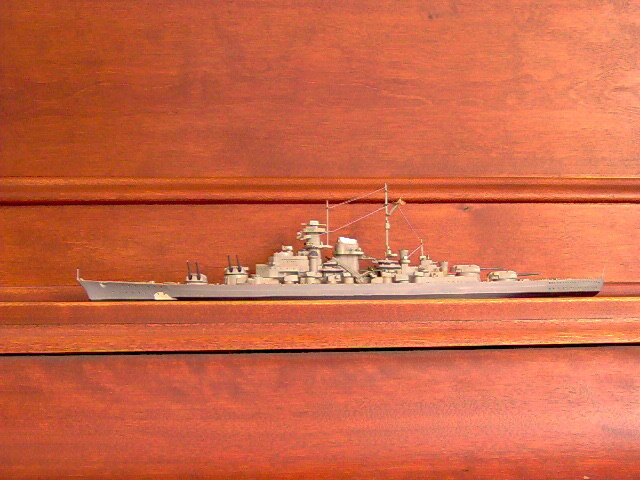 I am very grateful for the expert information on the ship from KBismarck.com! I now know that the false bow wave on the port bow is a much different shape, but when these were done in about 1979, they were a duplication of the pic from Pursuit by the marvelous Ludivic Kennedy, which only showed the starboard side. Think about it.... how many good pictures of the camouflaged ship are from the port side? What is the protocol for posting pictures? I purposely did them in in a VGA resolution so that they would be easier to post, although the 3MP examples are a lot better. "Bismarck, massive and elegant, with the high flare of her bows and majestic sweep of her lines, her ease and arrogance in the water, was then the most graceful, most powerful warship yet built." 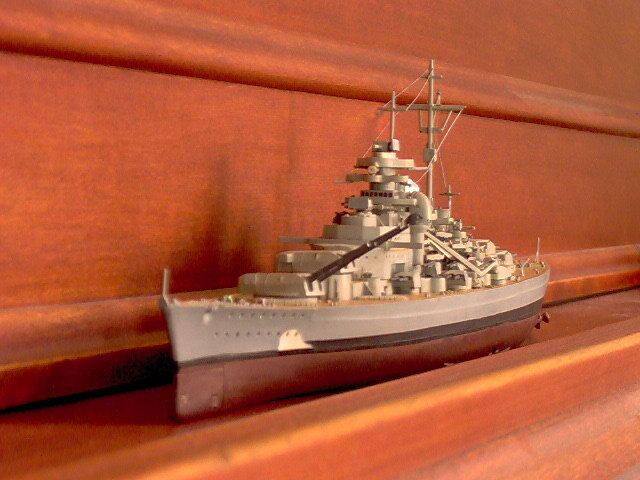 Re: Monogram 1/615 Bismarck from 1977. Bluemill wrote: What is the protocol for posting pictures? I purposely did them in a VGA resolution so that they would be easier to post, although the 3MP examples are a lot better. Hello. If you send a few to me via e-mail I could upload them to the site so you can later show them here in the forum. 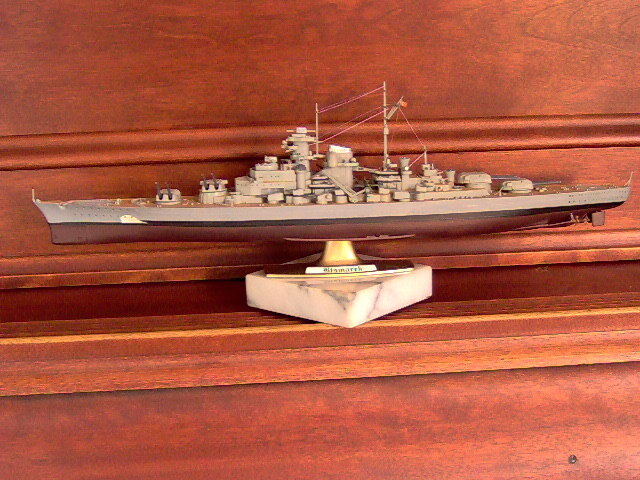 I just completed a restoration of a very old model that was gathering dust in my basement for thirty years. I have been intrigued with trying to make the old model look like the line drawings (from this site) of 24 May 1941 for a while, but never could find the time. The new Testor "ACRYL" paints were a huge help, and went on very smoothly with good cover with one coat. I only made a few piece modifications from the original kit, adding a little to the bow, to make the stem a bit more pointed. The rest of the changes from the original kit were were done with a paint brush. Windows for the admiral's bridge were painted on prior to assembly of the part. I used a water based paint, putting on a stripe of very dark gray, then very light gray below it for depth. After the paint was almost but not quite dry, I carefully scraped with a sharpened toothpick the edges of the windows. You need a small brush, good eyesite, and a steady hand. I'm pleased with how it turned out, especially with what the "before" looked like. Next project - the Dragon premium edition with etched metal parts. The base is an old piece of an electric lamp that my wife wanted to throw out. It is marble. The false bow wave was different than this on the port side, but when I did it way back then, I knew no better. 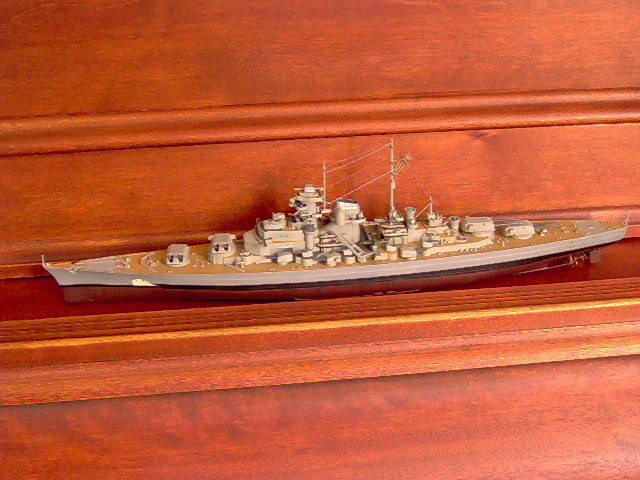 The edge of the piano key board lid serves as a waterline effect for the model.